Plan on play and witty verbal exchange during airy, communicative New Moon in Gemini. This is a good time to put energy into friendships, to attend meetings, or to study something of interest. Let your curiosity keep you on the move and in the moment. Excerpted from the We'Moon Journal & Datebook. This month I'm featuring lots and lots of Gemini artists because, well, Gemini does like company! Also interesting to note, is the fact that it was Gemini jewelers who responded to my call for Gemini artists. You'll understand more after reading their stories explaining how jewelry making just fits so well with a Gemini personality! As a Gemini artist, variety is my raison d’etre. I exist to create. One day I’ll spend six hours on an uber-meticulous wire-wrapped and crystal piece, and the next day it’s chunky gemstones and wood. My display is brimming with jewelry, and no two pieces are identical. I call my style “Zen jewelry” — whatever the inspiration of the moment is, I flow with it. I also built my display booth - modular wooden stands that can be set up quickly, and fold down neatly at the end of the day. Geminis are good at working with their hands, and I equally enjoy stringing beads or assembling wood. Art and craft are a continuum — I think of an idea and create it with my hands, whatever the medium. I’ve made acrylic paintings, wire puppets, and wall hangings. Geminis are known as great communicators, and I communicate most clearly through writing. Whereas visual art expresses one side of my creativity, written art — poetry and essays — gives voice to both my intellect and emotions. So many ideas, and only (I think) one lifetime to go. I have been blessed." 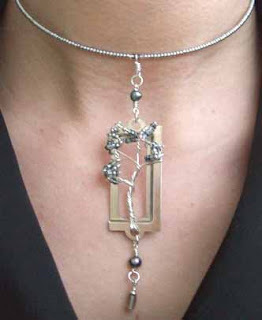 I love making jewelry because it allows me and my short attention span to focus on multiple things at once. 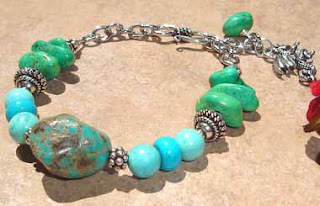 I usually make jewelry while watching tv or listening to the radio or talking to friends. "I am a Gemini and I do think that my work reflects that. For one thing, I don't have 'a look' mainly because I get bored doing the same thing over and over again. I need variety, a very Geminian trait! Also, as you can see I have lots of styles of jewelry, one for each of my sides I guess! I can also say that I don't make anything unless I'm in the right 'mood,' because my moods do rule my life. What I think is interesting about me personally is that I have a very analytical job which I love that totally feeds that side of my personality, and then I feed my creative side by doing jewelry - so it balances two aspects of my personality that are important to my well-being. To read more New Moon Artist posts please click here.